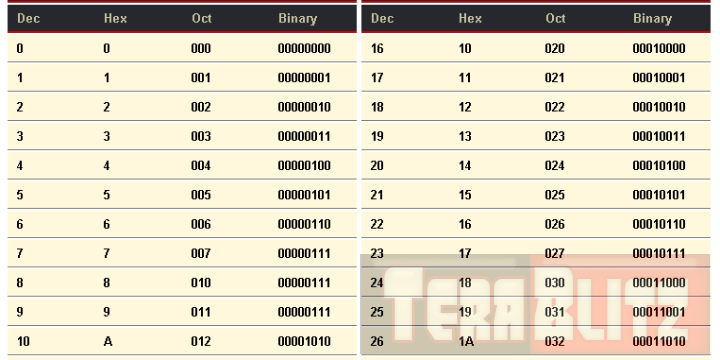 Binary Conversion Table to Dec, Hex, Oct Cheat Sheet. The Decimal (base 10) system has ten possible values (0,1,2,3,4,5,6,7,8, or 9) for each place-value. In contrast, the Binary (base 2) system has only two possible values, digits represented as 0 or 1, for each place-value. For your coding and programming convenience the table below provides you with an accurate binary conversion cheat sheet. It is neatly organized to its Decimal, Hexadecimal, Octal and Binary values.